Like the original Hutong in Hong Kong, the Shard version is a glitzy place with amazing views, ersatz Old Beijing decor, and a Sichuan/Northern Chinese menu. The Shard you already know. Hutong, half way up the Shard, needs more than just a ni hao of introduction. The original Hutong in Hong Kong is a glitzy, high-end Chinese restaurant with magnificent views, mainly patronised by expats and tourists. And this London branch of Hutong is exactly the same. The same Sichuan and northern Chinese menu, the same mix of plate glass and ersatz Old Beijing decor, the same hard chairs – even some of the staff are the same, brought over to help clone the successful original. What’s different about the Hong Kong and London kitchens is the level of spice. The Kowloon restaurants of David Yeo’s Aqua Group give the full assault of chilli and sichuan pepper, but three of the dishes we tried in London were much less fiery. Not meek, just toned down a bit for the gweilo (foreigner) palate. 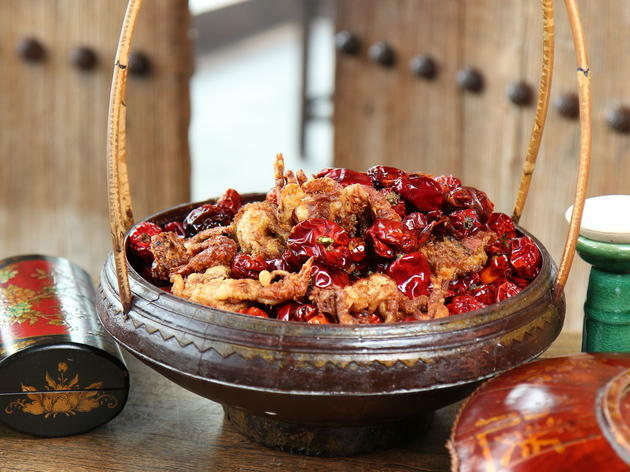 A ‘red lantern’ of softshell crabs had to be fished out of a huge bowl of decorative deep-fried chillies, a dramatic presentation which can render the edible part of the dish incendiary; yet the crisply cooked crabs were only agreeably spicy. Dan dan noodles had the recognisable ma-la (‘numbing, spicy hot’) combination of this Sichuan dish, but the dish was a bit overcooked and it was a little heavy on the peanut sauce, turning it into more of a soupy laksa than a Chengdu street snack. White meat was used instead of dark for the shredded chicken, but heck, most Estuary English speakers will prefer it that way . Northern Chinese food is at last making more frequent appearances on London menus. A dish of deboned lamb adapts very well to the UK, because British lamb is such good quality: pleasingly fatty, it was very tender once marinated, braised and then deep-fried. While the raison d’eat at Hutong is the menu of spicy dishes from China’s southwest and the heartier dishes from the north, lunchtime visitors who want to avoid spice all together can stick with the more delicate flavours of the dim sum menu (the xiao long bao – Shanghai soup dumplings – were good and well made). Hutong does credit to the growing trend for offbeat Chinese dishes. The service was good, the prices high, but then this is the Shard, not Chinatown. It’s a good date restaurant. This London branch of Hutong shouldn’t be left to the tourists and the expats. Hong Kong restaurant group Aqua has taken over the 31st and 33rd floors of the Shard. On the 33rd floor is Hutong, a contemporary Chinese restaurant modelled on the Hong Kong restaurant of the same name. On the 31st floor is Aqua Shard, a British restaurant. A three-storey high atrium bar serves British cocktails with an emphasis on gin and tea. On the 32nd floor is Oblix, run by the people behind Zuma and Roka. Hutong is modelled as an exclusive restaurant in the Shard. And it is with views of London city, expensive decor, and good service where you are always attended to. However, I wasn’t all that impressed by it. I found the food very mediocre considering it’s so pricey. We weren’t seated by the window so weren’t afforded the best views. As mentioned earlier, for me the service stood out. The staff were professional and attentive. If you want to impress someone, Hutong offers some, but not all of that sparkle. I can't fault the incredible view, the decor and the service - all above average! However, as a vegetarian I found the menu had limited choices and the portions were very small and not that tasty and of course expensive. I recommend it for a special occasion but be mindful of what the menu has to offer as I don't feel it caters for all to be honest. On the bright side, the cocktails are delicious! Situated on the 33rd floor of the Shard, Hutong has to be experienced to be believed. This Asian inspired restaurant seems to specialise in fish dishes but also covers all the meats you would expect too. We plumped for the 4 course set menu, featuring a monk-fish broth, steamed prawn, fish and vegetable dumplings, crispy beef with chillies, and a fish and tofu main course, all rounded off with a mango desert that cleansed the palate wonderfully. Alongside the meal we tried a variety of the cocktails on offer and we can confirm that they were all lovely, including the alcohol-free ones. The other aspect here is the views. If you are lucky enough to have a window table you will have panoramic view of London to enjoy while you eat. Gents, I also recommend using the facilities as it is quite an experience! The only downside is the prices but I felt that was to be expected for the venue and I haven't marked it down for this. I would say you will be looking at £50 a head, easily, on the set menu and substantially more if you go a la carte. The 33rd floor of the Shard is undoubtedly one of the most impressive locations in London for an all-out, birthday meal and of course neither the views nor the atmosphere disappointed. I have to admit that I'm spoilt - I spent my 21st eating at C'est La Vie (formerly Ku De Ta) atop Marina Bay Sands in Singapore and so I've been impressed with stunning asian tasting menus with sky-high views before and sadly Hutong does doesn't really compare. It feels a little like the menu is resting on it's panoramic laurels - flavours were good but the only stand-out and truly memorable dish was their 'Red Lantern' pictured above; a heavy lantern filled to the brim with red chillies, inviting you to dig for the soft shell crab treasure. Prices are ostentatious and highly inflated for the kind of food that we were served, I also know from hearing of friends' previous visits that this price point has been hugely increased since Hutong first opened which I simply can't imagine is justified. Main courses will set you back nearly £40 per head and aren't anything that you can't find elsewhere in London for a lot less. This is definitely one of my favourite restaurants in London! They have a wide selection of cocktails, of which I had were all delicious! Every single dish we ordered was delicious. The roasted duck was my favourite as he chef cut the duck at our table and then took it away to make another dish! The pork Dim Sum was chewy and so flavoursome. We also had cod which was served with sautéed green beans, which was also amazing. The wait staff are also very attentive with topping up your glasses! It's quite expensive but it's definitely worth going to as you're eating in the Shard! Definitely a restaurant to visit for a special occasion. Came here for a birthday celebration, we were a big group hence we got a semi private room with a dedicated waitress. The view was definitely amazing like what the other reviews mentioned , being situated on the 33 floor. We ordered the nine course set meal, it was authentic Chinese food, I love the prawn starters but I didn't get blown away by the other dishes though. Nice place for a special occasion as it's pretty expensive. There is no doubt that Hutong wins hands down for its views across London. Yes it is on the more expensive side and in the main both the bar and the restaurant give good reason to pay the premium. The staff were exceptionally attentive, the service when we ate there was spot on. Not one complaint on the standard of the food. There are of course many amazing Chinese restaurants to dine at across London, but if you are looking for something on top of the food then 33 floors up at The Shard certainly adds value. I was lucky enough to visit this restaurant through work so the range and amount of food on offer was amazing and much more than I would normally be able to afford. I was initially excited mainly for the views but actually the food surpassed the setting. Just the veggie spring rolls we had on arrival were amazing. There were various courses of duck, a huge lobster, and then a selection of mains including the most amazing lamb ribs with garlic. 2 of us had special dietary requirements which resulted in us having our own special menu and individual dishes when we were unable to eat one of the sharing plates. I was extremely impressed with the level of care and attention from the staff. The food was delicious and for a table of 8 there were 2 carrier bags of leftovers taken home! Would definitely recommend for a special occasion - they seem to have a few options with more affordable set menus if you don't want to go for the full on a la carte. Perched on the 33rd floor of the shard, with its far reaching views and decadent interiors lies Hutong. Customer service was good but obtrusive with the sommelier feeling the need to top up our glass every few minutes, the food is average and in keeping with the shard cocktails and drinks overpriced. Forget tap water, the waiters offer you a choice of still or sparkling at £5 that's probably the cheapest drink option. We booked the 3 course lunch taster menu £33 which consisted of a sea bream and tofu soup, beautifully presented DimSum and shared mains consisting of a spicy battered cuttle fish, a chicken in black bean sauce, packchoi and egg fried rice. Whilst the food was good, I have eaten much better for far less in China town. We opted to try out one of the cheaper bottles of wine at £48. So what does Hutong have going for it, far reaching views, amazing toilets with a view and beautiful interiors. The bill is beautifully presented in a pillow box and it leaves us speechless not because of its beauty but @£180 for the three of us for 1 bottle of wine, a bottle of water and 3 courses of average food. Thank god the company was awesome and the views great, will I be rushing back probably not. Fine dining in the sky... this is one of the higher end chinese places for food. 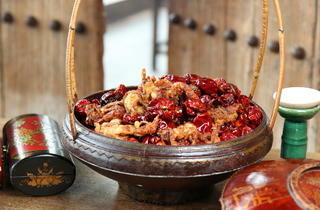 But the premium is worth it especially for the Red Lantern dish (which is a basket of soft shell crab. yes a basket, not just a plate). The views are stunning and I was lucky enough to get a window-side table. The only downside of such a table is you have other diners constantly coming by your side and taking photos while you are trying to enjoy the food on offer. Reservations are a nightmare to obtain so book a month or 2 in advance! This is a really fancy and expensive place to go to! However, i booked a deal for lunch for my sisters birthday and it was so amazing! It was 30 pounds per person without drinks, but the food was insertional and there was a lot of it, so it didn't feel like a rip off. Overall great view and food! Would go again for special occasion! Last night was my 3rd visit to this very very good Chinese restaurant. At the 33rd floor of the shard, the best time to get here is just as the sun sets and you can watched London transform from day life to night life. There is a very pleasant bar to enjoy pre-dinner cocktails before indulging in some amazing food. It is very dark and full of wood, the chairs are somewhat a little weird but the views are amazing of the west and the city. To start with the dim sum are very very good, great flavour and not to doughey. Then the Duck. This has to be some of the best Duck I have tasted, and definitely the juiciest. It is carved at your table and is laid out of you to help build your pancake roll. The leg and thigh meat are then whisked away to be created into a very nice extra little course. The mains are just as good, the ones to go for are, and first of all the most impressive when it hits the table is "Red Lantern Crispy soft-shell crab with Sichuan dried chilli" The crispy Shredded beef is very very nice along with the kung Po Prawns. The service still has room for improvements, but is not bad at all. It just could be a lot better considering a meal for 4 will set you back about £300. All in all the views are amazing and the food is very good. Fancy and expensive Chinese restaurant up 33 floors in the Shard. Portions are very small so maybe don’t go if you’re really hungry and you don’t want to pay for it. However the décor and the setting is amazing, the theme is really strong and the views just speak for themselves. The waiter serving us when we went was very attentive and friendly and I would say the service is definitely top notch. I went for a weekend lunch so I’m not sure whether the atmosphere would be much different in the evening. However I am sad to say I have personally tried better and more affordable Chinese food elsewhere in London with possibly more generous portions. The selection is definitely somewhat restrictive to what you would expect. I would definitely say it is an experience and a good place to visit on a special occasion but if I would go again, I’m not sure. Terrible service for such an expensive restaurant. View is not enough to sell a place if the attitude of the staff is bad. BTW, a table with a good view is not guaranteed and one may end up at the back tables where there is just bad service! Plenty of better restaurants out there. A place that I would visit again that's for sure. The staff are friendly, the ambience wonderful and the food is ever so tasty. My husband and I went to the bar first for a few drinks before our meal. I went for a couple of the non alcoholic cocktails available, my favourite being the Dragon Flower. We ordered the tasting menu, with many delicious dishes to try we finished our meal feeling very happy. The shredded beef was amazing! I can never have shredded beef anywhere else ever again! Great views, but the food has a lot to be desired. Food was not tasty and was very expensive. Service was so poor and they lacked any kind of customer service. It's a nice place for drinks, but don't bother with the food. Great location, but I didn't find the food exceptional; I think you can find equally good fayre in China town. This is a special restaurant. It's location halfway up the Shard means as you eat the stunning Sichuan food you can watch the most spectacular views across London (go around sunset, it'll take your breath away). Don't miss the soft shell crab or the duck done two ways. It's not cheap but for a special date or treat or if you're trying to impress business clients you'd be hard pushed to find a better spot in the city. I've been three times and I'm slowly working my way through the menu and I haven't been disappointed by a single dish. Having travelled through China I can assure you this is not only authentic but highly refined and wonderfully executed Chinese food. Although there are many Chinese restaurants in London serving food as great at Hutong, you go here for the views to impress your guests (but you pay the price). Excellent tasting menu and dim sum, one of the best roast ducks we’ve ever sampled. Low bebe score as although there are the facilities, Hutong is a bit chic and sophisticated to take a messy baba. I came here with a group of friends for a birthday meal. The food was amazing! Best Chinese food I have tried. Very authentic. And the views were stunning! Definitely would like to try it again and also recommend others to do so. Overall experience was somewhat disappointing. We arrived about ten minutes early for our sitting so were advised to wait in the bar before being collected once our table was ready. We sat at a table in the bar for a fairly long period without being offered a drink. When we were shown to our table we were delighted to find we had great views looking east over London. However, we were disturbed by numerous patrons from the bar who thought they could use the restaurant seating as an extension of the bar area. Whilst our waitress did remove them it was an unwelcome and regular occurrence. What was worse was the allowance of bar patrons to walk around the restaurant area taking photographs. The food was fantastic, particularly the lamb ribs and the wagyu beef puffs. The service was very attentive, if a little over-bearing. Yuo're paying for the views here but my advice, have one drink at the bar, soak up the views then go for a better service/food combination elsewhere. I tried to make a reservation by calling them. I was put on hold for 3 minutes, and got tired and hung up. No worries, there are lots of other restaurants out there. Exciting and dramatic as you would hope, a thrilling aspect but disappointing food and service. A great choice for a mixed age family celebration I thought, so along we all trooped ranging in age from 9 to 90. After initial thrill, the details came into focus. the smeary black laminate tabletop, the lack lustre service and some showy dry ice filled teapots filled with truly disgusting jasmin tea cocktails..( I had to cajole the grim faced barman into eventual action) it seemed as though no one cared whether we liked them or not. The food was sticky, shiny and over seasoned with a bog standard chinesy tasting powder, reminiscent of a cheap oriental buffet, half cold into the bargain. At least It didn't matter that the portions were small. The star of the menu, slow baked lotus leaf beef was quite honestly revolting and strange...I couldn't even drown my sorrows with the jasmin cocktail as it really was,well. terrible. We passed on the desert and left naturally somewhat grumpier than we arrived, now wondering if we could actually afford to buy ice creams on the south bank..Rain forced us all into the nearest starbucks for a warm up..
A visit to the ladies loo sort of sums it up. At first glance, colonial lattice gorgeousness, then you see how phoney and poorly designed it all is. The loos are tiny and the doors are mini saloon style requiring 2 hands to secure the flimsy latch, actually a hook and loop like you'd find in a cheap shed. Meanwhile your handbag falls on the floor for everyone at the basins to see, as the gap between floor and door is at least a foot high, god forbid it's a full house and you break wind... . and of course it's just so undignified, seeing some stranger's trousers round their ankles....I mean, who designs these places ?! Visited with family for a birthday and were given a private room with an excellent view over London. The decor is very good and very attentive service. However, food was nothing special. We had a few vegetarians in our party and for me, although I eat non-veg, I tend to judge a restaurant on how well they cater for vegatarians. With Hutong the menu is very limited, for both non-veg and veggies alike - in virtually all chinese restaurants that I've visited, the chef is normally more than capable of conjuring up some veggy dishes, but not at Hutong - which was a shame. Its not a place that I would go again for dinner, but would certainly go for the bar and the amazing views. Oh yeah, the restaurant does have a valet parking service which costs £20 if you decide to drive their. Exceptional view, refined design, distinct staff and fantastic food. Would love to return! Visited with a group of friends on a saturday night, we had a stunning table by the window, you simply cannot fail to be spellbound by the views. From the moment we arrived the service was attentive and super efficient. The food was amazing, particularly the soft shell crab which was sublime. Fantastic bar with a great buzzy atmosphere perfect for pre/post cocktails. Would return in a heartbeat! Appalling reservation service. Call was answered VERY slowly, then left on hold for an age, and had to call back four more times from Dubai at 6:30pm UK time on a saturday evening to even get a response from the reservation dept. Even then, they could only take my number, and say that my reservation would be confirmed or not the next day............I hope the food is better than their reservation service!! The demure but classy day view here slides in to red hot seduction as the sun dims over the Londonscape spread out before and very much below you. We were fortunate to have a window table, just so amazing being on the 33rd floor of the Shard, and such a very glamorous feel and look to it. Apparently all the decor has been shipped over from China, the staff were keen to tell us, two dragons guarding the staircase either side at the top as you walk up, wonderful wooden doors and a 'screened but not' bar and private rooms, like a glimpse of garter and bare thigh at the swish of a skirt. Negotiating the menu was a challenge, with 4 contrasting tastes, one of us no spice at all, but having been there before the one dish I knew we 3 Spice girls had to have is their Red Lantern speciality. It comes up, a large deep dish held centrally by bamboo, looking like a lantern I assume, photo above currently. On the top are a froth of red chillis, a couple of inches deep. The waiter digs the chopsticks in to the fiery mass and there are about 8 large tempura'd soft shell crabs,crisp, melting, crunchy, spicy, totally yummy. And boys, don't get macho, these chillis are n't the equivalent of the Vindaloo challenge after 20 pints of beer on a Friday night in Darlington, these babies are definitely NOT for eating, not unless you want your mouth numb for the next 20 minutes, (you're right, one of our boys tried it my previous time here). Negotiations amongst us delivered up half a Peking duck, which is presented and carved in front of you, by the designated duck chef. (The most surreal experience in London has to be looking over at the open brick chimney with real flames and the ducks adangling, on the 33rd floor of a glass tower with the skyline behind) Lacquered golden red skin glistening next to darker juicy slices of breast and leg meat, scooped in to fresh white pancakes from the bamboo steamer, with soy jam, cucumber and spring onion, what a feast of tastes and textures, and I don't normally like duck! What is left after the carve up is taken away and comes back as the next course, with the duck snippets stir fried with onions and veggies and eaten in lettuce leaf cups. The non spicy main was chunky melting white cod with a fried golden tofu sprinkle, all right for the veggies and the chilli wimps but I preferred the spicier offerings. The large prawns with tea leaves were in a similar vein, and similarly enjoyed by the two veggie/CWs, but I've always considered subtlety overrated when you could have hot and spicy.The noodles were a little spicy and so more-ish, we ordered a second portion. For starters we had the razor clams, which are cold, and the asparagus spears, also cold and nicely al dente, dipped in scrunchy sesame seeds and with a soy/spring onion dip. On a previous visit we had a spicy rice dish that we loved, and also the lamb ribs, another signature dish but we tried some new ones this time around. We were guided by the professional, charming and very helpful Ming, the maitre d'. Was there a hint of a raised eyebrow as we attempted to order enough to feed half the restaurant? If so, he gently helped us chop out several of our desires. We chose a wonderful Viognier to go with the meal, powerful enough to cope with the spice. Will we go back? As soon as we can get another table, this place is so hot it's sizzling! Don't expect your food to come out at the same time! Terrible experience last night at Hutong. We had reserved for 6 people at 9pm. Went to the bar at 8pm, arriving in two groups via a lady with a clipboard who checked we were booked in and the time. Went for dinner and the guy behind reception told us that our reservation was for 10pm. No, we've booked for 9pm. No, I have a reservation for you at 10pm. But we booked for 9pm etc. No hint of 'sorry', only lots of attitude that we were wrong. And there were no tables available for at least 45 minutes. The maitre d', who knew two of our group from Sketch, tried to sort it out but the guy behind the counter was not having any of it. After a while the guy goes "look, I've said sorry, we don't have any tables". No mate, you didn't. That's the point. Say sorry, everyone messes up occasionally, just have a lot less attitude. Your system has messed up, you've made it far worse. No thought of finding us a space at the bar and giving us a glass of wine each. Then he realised he could actually give us a table - a private room that was not being used. So 6 of us sat on a table for 10 people, shouting across the table to be heard. We asked to be moved once a table came up but, again, it never happened. Then food arrived. Before the wine we ordered. Where is the wine? Oh sorry let me get it for you. At this point we were laughing at how much of a mess it was. These guys are amateurs and this restaurant needs sorting out, and quickly. Two stars because the food was alright. Barshu would have been a far better option. A terrible first experience I'm afraid. Having tried numerous times over the past couple of weeks to get through on the reservations number and not having the phone answered I emailed the reservations team directly. I was told there was a table available for 9:30pm and I emailed back to reserve. I finally got through to the reservations number today to confirm the table for this evening. They advised me that they do not have any record of my reservation, despite me having the name, date and time of the email I received from their reservations team. I therefore do not have a table for my partner's 30th birthday this evening as they were not able to find me one at any time at either Hutong or Aqua Shard. Awful customer service. WOW, what can I say, Friday evening at Hutong was such an incredible experience and I want to emphasise on the word experience. When we arrived, from the word go the staff were very polite and welcoming. We were shown to one of the best table in the restaurant with the most beautiful views overlooking London. It really takes your breath away! We were lucky as it was the longest day of the year, so a very long sunset which was amazing. The waiter, Sid, was so kind, generous and helpful. He was spot on with his suggestions especially pairing the food with a delicious Spanish red wine. We started with the most delicious razor clams infused with garlic (A LOT of garlic), spring onions and soy. We then enjoyed a selection of Dimsum. It wouldn’t have been a complete dinner without the Peking Duck, which was the best I have ever had. The chef comes over and slices it up in front of you. Followed by the spiciest king prawn and spring onion dish, a very good recommendation by Sid, as well as the best crispy shredded chilli beef and rice. Now, we were offered to have the soft shell crab, we saw it presented to other tables and the biggest wave of food envy came over both of us but we were so full we couldn’t possibly have fit it in. This is one of many reasons why I shall go back and encourage many others to go too. Thank you so much and thank you to the team at Hutong for making it an unforgettable evening. You really do use all you senses when you are there, from seeing the view, tasting delicious spices, feeling the adrenalin of being so high up and smelling the aroma.